After a home pregnancy test has turned positive and a blood test measuring levels of human chorionic gonadotropin (HCG) has confirmed a pregnancy, the next proof of pregnancy is an ultrasound. When you have your first ultrasound your doctor may talk about the presence or absence of the gestational sac. What exactly is the gestational sac, when can it first be detected on ultrasound, and what does it mean if it is or isn't there? What does it mean if a gestational sac is seen, but appears to be empty? One of the first signs of pregnancy to show up on ultrasound is the gestational sac, the sac which encloses the developing baby and contains amniotic fluid. The gestational sac is found in the uterus and on an ultrasound, it appears as a white rim around a clear center. The gestational sac forms around five to seven weeks after the last menstrual period in natural cycles, so it is usually visible between 3 and 5 weeks gestational age using a transvaginal ultrasound. A transvaginal ultrasound has a higher sensitivity and produces clearer images than a transabdominal ultrasound. The gestational sac is usually seen when your hCG levels are between 1500 and 2000. If a gestational sac is seen on your ultrasound, is this a guarantee of a normal pregnancy? Visualizing a gestational sac is certainly a positive sign of pregnancy, but it is not a guarantee that your pregnancy is healthy and will proceed normally. For example, after the sac becomes visible, the next positive sign of pregnancy is a yolk sac that develops within it. The yolk sac provides nutrition to the developing embryo until the placenta takes over, and is thus an important indicator of pregnancy health. In some cases, a gestational sac will be detected on ultrasound, but a yolk sac is subsequently not found. The yolk sac usually becomes visible on a transvaginal ultrasound between 5 1/2 and 6 weeks gestation. What If a Gestational Sac Is Not Seen? Your dates are off. This is a common reason and may simply mean that you need a repeat ultrasound later on. It can be helpful to compare this finding with your hCG levels, which would likely be lower than 1500 if you are not as far along as you thought in your pregnancy. You have miscarried. It could be that you had a very early miscarriage (chemical pregnancy) or that you will be miscarrying. Falling hCG levels are also a sign of miscarriage. You have an ectopic pregnancy. If your hCG levels are between 1500 and 2000 but a gestational sac is not seen, it could mean that you have an ectopic pregnancy. An ectopic pregnancy can be a medical emergency, and if this is a possibility your doctor will want to do further testing and talk about treatment options. What Does an Empty Gestational Sac Mean? 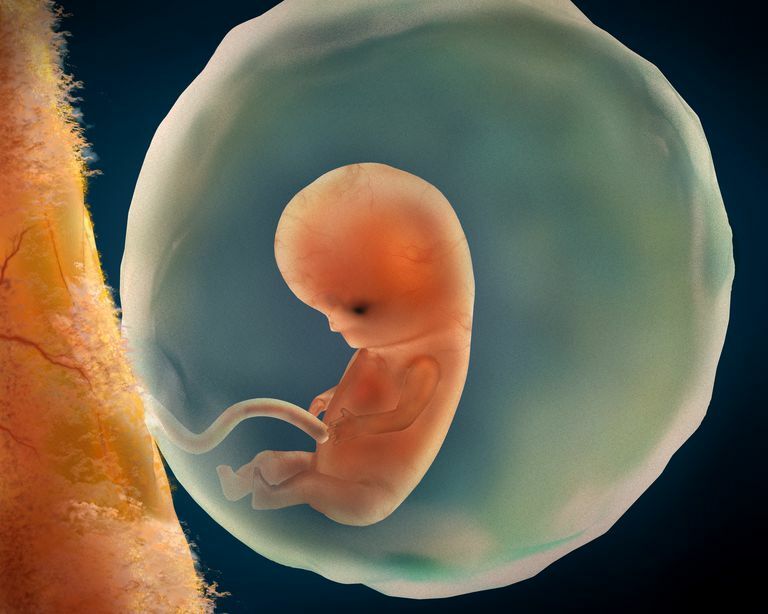 An embryo is usually seen within the gestational sac by 6 weeks gestation. One of the more common types of miscarriages, known as an anembryonic pregnancy, empty sac, or blighted ovum, happens when a gestational sac does not contain an embryo. In other words, an embryo failed to develop. This type of pregnancy loss occurs early in the first trimester, and often before a woman even realizes she was pregnant. It can be the result of abnormal cell division, poor quality sperm, or a poor quality egg. In most cases, chromosomal abnormalities will cause the woman's body to miscarry naturally and without intervention. However, there are some cases in which a woman may choose a dilation and curettage (D&C) to complete the miscarriage. This procedure may be desirable for women who want a pathologist to try to find a cause for the miscarriage, for those who feel it will help them cope better with the loss, or for physical or medical concerns raised by her physician. What If My Doctor Sees an Empty Gestational Sac? If your doctor discovers an empty gestational sac on an ultrasound, he may confirm that your pregnancy is nonviable—in others words, that the pregnancy will not result in the birth of a baby as it is not progressing normally. But sometimes (depending on the size of the gestational sac), it may be a bit too early to determine that the sac is truly "empty." In this instance, your doctor will ask you to return for a repeat ultrasound. This can be an anxiety-ridden time but is meant to ensure a 100 percent accurate diagnosis (that the pregnancy is either viable or nonviable). Early transvaginal ultrasounds are a relatively easy way to follow a pregnancy early on, and along with hCG levels can give you and your doctor an idea about how your pregnancy is progressing. The gestational sac is the first structure physicians look for with an early ultrasound. When it is present (at between 3 and 5 weeks gestation), it can be a positive sign. That said, sometimes a gestational sac is seen but is found to be empty, without evidence of an embryo by 6 weeks gestation. On the other hand, sometimes a gestational sac is not seen. The most common reason for this is inaccurate dates and it is simply too soon. But if a gestational sac is not seen on follow-up, or if your hCG levels indicate one should be seen, you could potentially be having a miscarriage or ectopic pregnancy. Pregnancy can be a joyful time, but one ridden with anxiety as well when things don't go as you'd like. Lean on your friends and family members. If it's thought that you are having a miscarriage, have a blighted ovum, or an ectopic pregnancy, it can be a huge emotional blow. This is especially true as many couples haven't yet shared their pregnancy with family and friends, so you may feel very alone. There are stages of grief associated with miscarriage, even when it occurs early. Added to that are the often well-meant but hurtful comments such as "you can always have another." It's important to honor your feelings and grieve in the way that's best for you. Richardson, A., Gallos, I., Dobson, S. et al. Accuracy of First-Trimester Ultrasound in Diagnosis of Intrauterine Pregnancy Prior to Visualization of the Yolk Sac: A Systematic Review and Meta-Analysis. Ultrasound in Obstetrics and Gynecology. 2015. 46(2):142-9.